As with so many other hot-button debates, the climate change controversy leaves me repelled by the clamoring extremists on both sides. Global-warming denialists, as some are aptly called, regard the scientific establishment with such contempt that they abandon the realm of reason. In comment after comment posted on on-line articles and blogs, self-styled skeptics insist that carbon dioxide is such a scant component of the atmosphere that it could not possibly play any climatic role, while castigating mainstream climatologists as malevolent conspirators dedicated to destroying civilization. Yet on the equally aptly named alarmist side of the divide, reasonable concerns often yield to dismal fantasies of the type so elegantly described by Pascal Bruckner in The Fanaticism of the Apocalypse, upheld by exaggeration to the point of absurdity. More alarmingly, climate activism seems to be veering in an unabashedly authoritarian direction. In such a heated atmosphere, evenhanded positions are at the risk of being flooded out by a rising sea of mutual invective and misinformation. This essay addresses only one side of this spectrum, that of the doomsayers who think we must forsake democracy and throttle our freedoms if we are to avoid a planetary catastrophe. Although it may seem paradoxical, my focus on the green extreme stems precisely from my conviction that anthropogenic climate change is a huge problem that demands determined action. Yet a sizable contingent of eco-radicals, I am convinced, consistently discredit this cause. 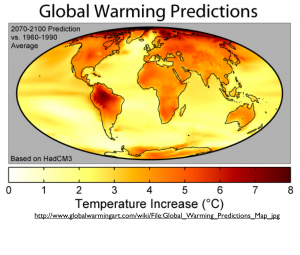 By insisting that devastating climate change is only a few years away, they will probably undermine the movement’s public support, given the vastly more likely chance that warming will be gradual and punctuated. By engaging in mendacious reporting and misleading argumentation, they provide ample ammunition for their conspiracy-minded opponents. And by championing illiberal politics, they betray the public good that they ostensibly champion. It is a sad day indeed when an icon of liberalism such as Robert Kennedy Jr. can plausibly be deemed an “aspiring tyrant” for wanting to punish global-warming deniers. 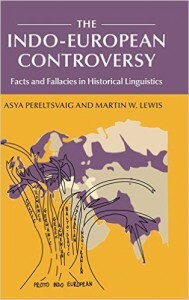 Before delving into Oreskes and Conway’s dismal predictions and authoritarian proposals, a few words about the structure and contents of their unusual book are in order. As the authors explain in their first two sentences, The Collapse of Western Civilization aims to “blend the two genres” of science fiction and history in order to “understand the present.” In actuality, virtually nothing that is recognizable as either science fiction or history is found between its covers. 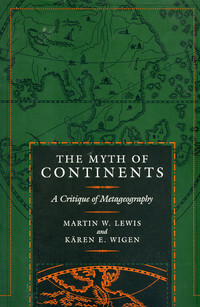 Instead, one encounters a brief text (52 pages*) that purports to be a straightforward account of the planetary catastrophes of the 21st century, written by a fictional historian living in the Second People’s Republic of China three hundred years after the final collapse of “Western Civilization” in 2093. This imagined author informs us that that Western Civilization was destroyed by its obsession with free markets and devotion to a “carbon-combustion complex,” which is contrasted with the authoritarian system of China that allowed it to survive and eventually help restabilize the global climate. [S]urvivors in northern regions of Europe, Asia, and North America, as well as inland and high-altitude regions of South America, were able to begin to regroup and rebuild. The human populations of Australia and Africa, of course, were wiped out (p.33). 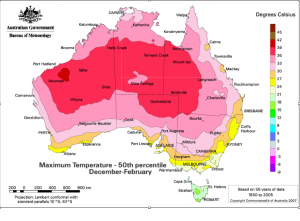 Why yes, of course; how could anyone be expected to survive global warming on continents as hot as Australia and Africa? The only problem with this assertion is the inconvenient fact that vast areas of both landmasses are not particularly warm. 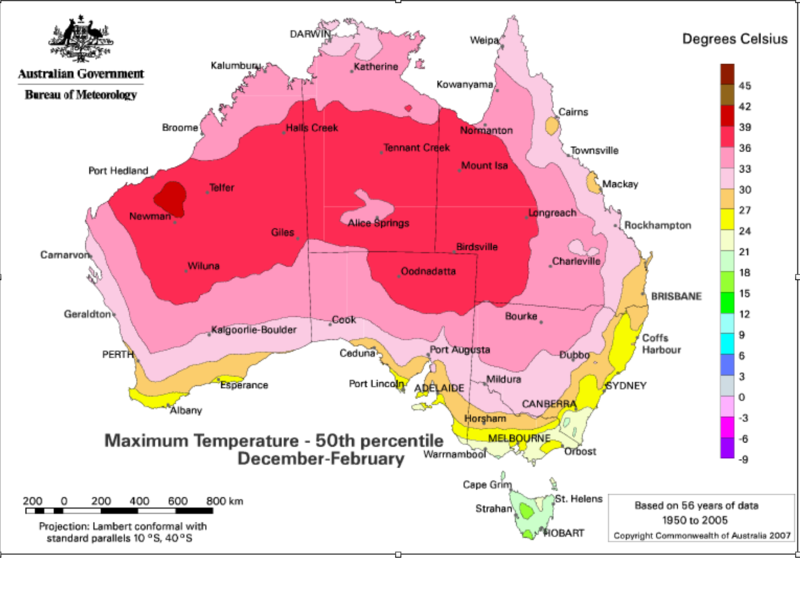 In Melbourne, Australia the average January (summer) high temperature is 78° F (26° C), only slightly above that of July in Paris. Hobart, a city of more than 200,000 inhabitants, posts summer temperatures virtually identical to those of Stockholm. ** Nor is Africa climatically extreme; most of South Africa is temperate, and the mountains of Algeria and Morocco are cooler still. Throughout eastern and southern Africa, high elevations ensure equable conditions. Contrary to Oreskes and Conway’s warnings, inland Africa is generally less vulnerable to climate change than most parts of inland South America, owing mainly to its higher elevation. Currently, the average high temperature in the warmest month in Asunción, Paraguay is a whopping 10 degrees Celsius (19 degrees Fahrenheit) higher than that of Addis Ababa, Ethiopia. The same gap, moreover, is found in regard to the highest temperatures ever recorded in both locations. Such temperature contrasts, however, are not the main issue. 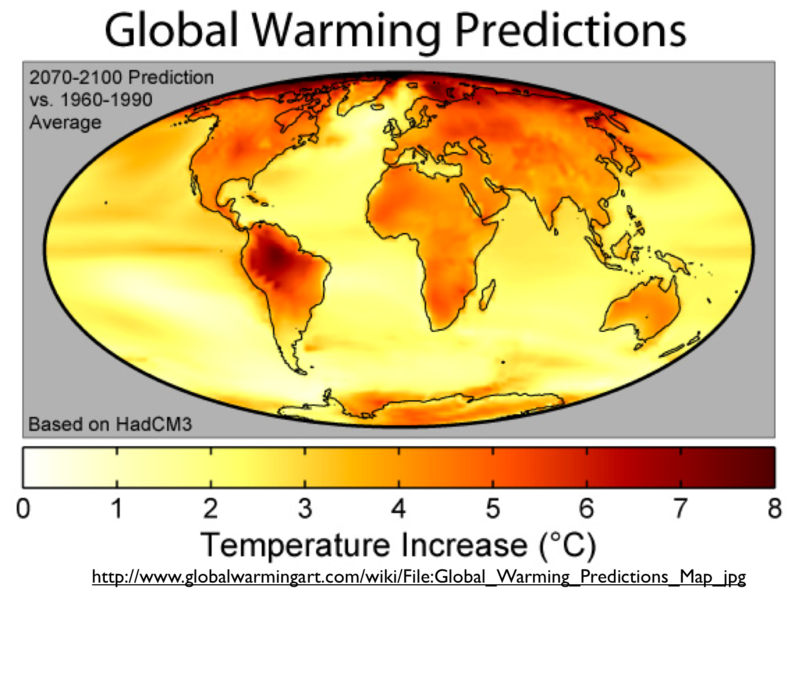 Rather, it is the fact that even the most extreme scientific predictions of possible global warming over the next century do not posit conditions that would preclude human life over vast expanses of the world. People can live quite well in hot climes, and can even do so without air conditioning. Perhaps Chicago will eventually become as warm as Dallas, which currently has an average July high temperature of 96° F (35.6° C), and perhaps Dallas could become as hot as Las Vegas, with its average July high of 104° F (40° C). But even with such a development, neither town would reach the current conditions of Kuwait City, with its average July high of 116° F (46.7° C) and sultry average July low of 87° F (30.7° C). As the Great North American Desert surged north and east, consuming the High Plains and destroying some of the world’s most productive farmland, the U.S. Government declared martial law to prevent food riots and looting (p. 25). 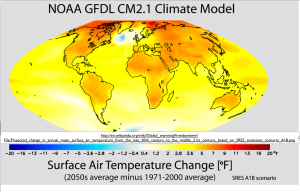 It is true that many climate models indicate increasingly aridity over the Great Plains and the Corn Belt, which would certainly harm U.S. food production. But at the global scale, such thinking does not pan out, as a warmer world will almost certainly be a wetter world, enhancing agricultural potential in many dry areas—even if more precipitation does come in the form of torrential downpours. 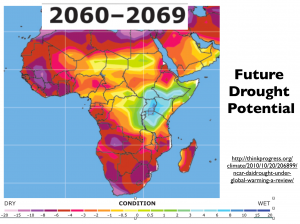 If some parts of Africa will lose their food-production potential, others may see it enhanced. 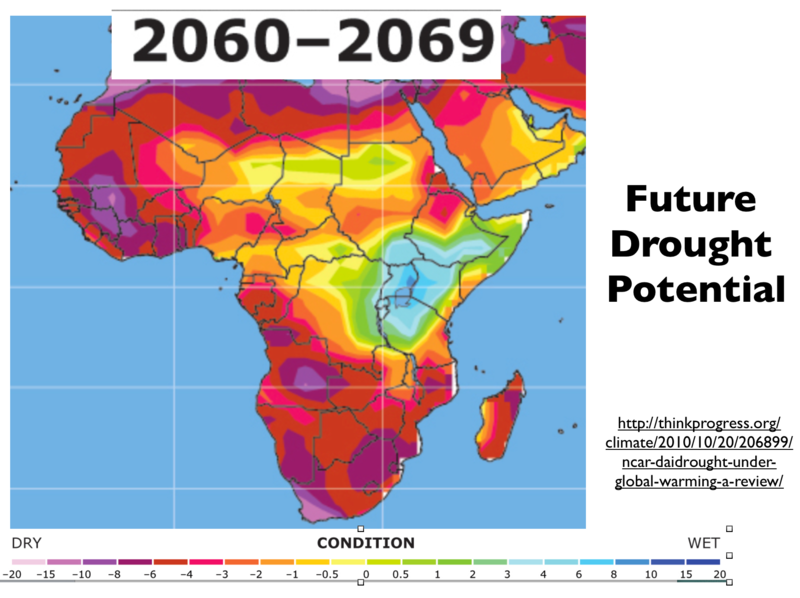 Much of East Africa is shown in some models as acquiring a less drought-prone climate, as can be seen in the map posted here. And as is currently the case, most of Africa will remain immune from hurricanes and tornados, the increased intensity of which, moreover, is not assured. (The equatorial belt will always be cyclone-free, as the twisting Coriolis effect diminishes to nothing at latitude zero.) It must also be acknowledged that higher levels of carbon dioxide are to an uncertain extent associated with enhanced vegetative growth. Some evidence even indicates that elevated CO2 allows plants to better withstand aridity, as their gas-exchanging leaf pores (stomata) do not need to open as widely under such conditions, reducing transpiration and hence water loss. The mere mention of any such possible positive consequences of climate change, however, is widely regarded as intolerable heresy, and hence would never appear in a book like The Collapse of Western Civilization. I hesitate here as well, as I do not want to imply that the gains of climate change could somehow cancel the losses. In the end, however, honest disclosure of the existing evidence is an obligation of all serious scholars. 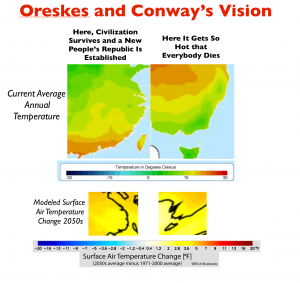 Regardless of whether climate change will undercut food production, Oreskes and Conway’s own prescription for dealing with the crisis would only intensify the problem. They strongly support, for example, biodiesel and other forms of biologically derived fuel, viewing “liquid biofuels for aviation” as nothing less than “crucial” (pp. 21, 24). Channeling biological production into the energy system, however, either diminishes the human food stream, raising the price and reducing the availability of staples, or detracts from natural ecosystems, diminishing the scope of non-human life. 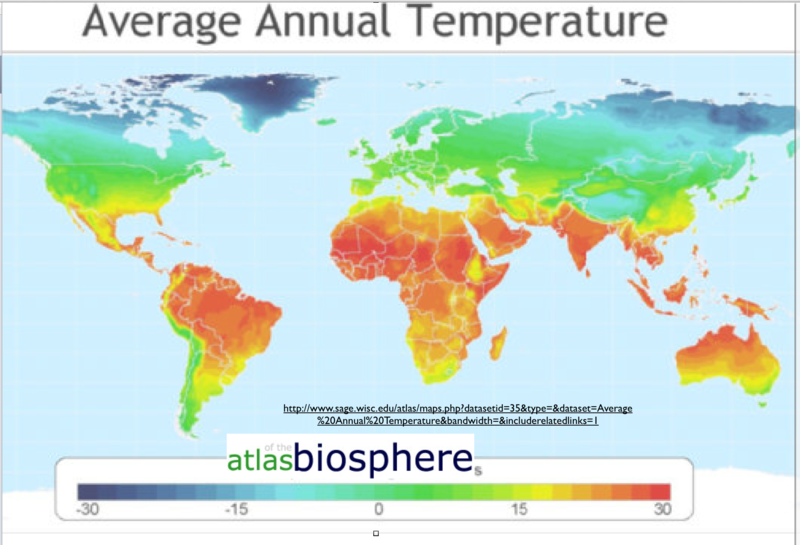 As Will Boisvert has devastatingly demonstrated, there is nothing at all green about biofuels. 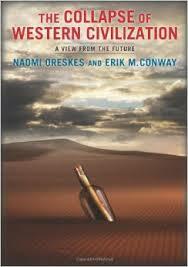 Oreskes and Conway’s support of biofuels is linked to their dismissal of natural gas. They reserve particular contempt for the idea that gas could act as an environmentally beneficial “bridge to renewables.” Most of their arguments against gas are familiar, focused on such issues as the “fugitive emissions” that occur when carbon dioxide and methane “escape from wellheads into the atmosphere.” (p. 23). Such leakage is a genuine problem, but most experts think that it can be solved by technical means. Some of their other objections, however, are novel, such as the idea that natural gas will replace near-zero-emission nuclear energy and hydropower, especially in countries such as Canada (p. 23). Why such a substitution would occur is not specified, even though the possibility that it would is extraordinarily low. The costs of hydropower in particular are almost completely upfront; once a dam has been constructed and the turbines installed, the resulting power is cheap and hence not vulnerable to replacement by natural gas. The only reason why Canada might be tempted to dismantle its hydroelectric and nuclear facilities would be political pressure from environmental activists. Would Oreskes and Conway be among those urging the end these extremely low-carbon sources of power? One cannot tell from the book in question, but in other writings (here and here) Oreskes rebuffs nuclear power, due mainly to “difficulties inherent to the technology and its management.” It would thus appear that this particular objection to natural gas is self-cancelling. [T]he year 1540 was one with an even more severe summer than 2003. All over Europe, the heat wave lasted, off and on, for seven months, with parched fields and dried up rivers, such as the Rhine. People in Paris, France could walk on the riverbed of the Seine without getting their feet wet. [E]mphasized study of the world’s physical constituents and processes … to the neglect of biological and social realms and focused on reductionist methodologies that impeded understanding of the crucial interactions between physical, biological, and social realms (p. 60). Oreskes and Conway embrace “interaction” to such as extent that they even regard “environment” as another concept that will eventually be dismissed as archaic, as it supposedly entails “separating humans from the rest of the world” (p. 55). In actuality, most people use the term “environment” precisely to highlight connections among humans and the rest of nature. But according to the authors, it was not until the coming of “radical thinkers such as Paul Ehrlich and Dennis and Donella Meadows” in the late 20th century that anyone “recognized that humans are part of the environment and dependent upon it” (p. 56). Such claims are preposterous, as the history of Western thought thoroughly demonstrates. To appreciate the historical depth of such recognition, I would recommend Clarence Glacken’s magisterial, Traces on the Rhodian Shore: Nature and Culture in Western Thought from Ancient Times to the End of the Eighteenth Century. Although many of the key scientific questions of the day do indeed demand, as Oreskes and Conway write, an “understanding of the crucial interactions between physical, biological, and social realms,” it is equally imperative to recognize that most do not. Most of the issues addressed by chemists, physicists, and geologists have nothing to do with the social realm, and must be examined through a “reductionistic” lens if they are to be approached scientifically. To insist instead that they must be framed in a socio-biological context is to reject the methods of science at a fundamental level. Such a tactic risks reviving the intellectual atmosphere that led the Soviet Union to the disaster of ideologically contaminated research known as Lysenkoism. In the final analysis, the denial of science encountered in The Collapse of Western Civilization thus runs much deeper than that found among even the most determined climate-change skeptics, as it pivots on much more basic epistemological and methodological issues. Not just science by also logic suffers at the hands of the author. They argue, for example, that it is a logical fallacy to contend that natural gas could serve as a “bridge to renewables,” due to the fact that analyses of the effects of natural-gas combustion on the atmosphere have been “incomplete” (p. 53-54). In actuality, this is an empirical issue, not one of logic per se. And so the development that neo-liberals most dreaded—centralized government and loss of personal choice—was rendered essential by the very policies that they had put in place (p. 49). This tactic, however, is disingenuous. No evidence is provided, for example, to indicate that autocratic governments respond more effectively to environmental crises than democratic ones. Rather, this thesis is merely assumed, despite the large body of evidence that points in the opposite direction. It is, moreover, an unfortunate fact that global carbon-dioxide emissions will continue to rise for some time regardless of any minuscule effect that the publication The Collapse of Western Civilization and similar books may have on public opinion. 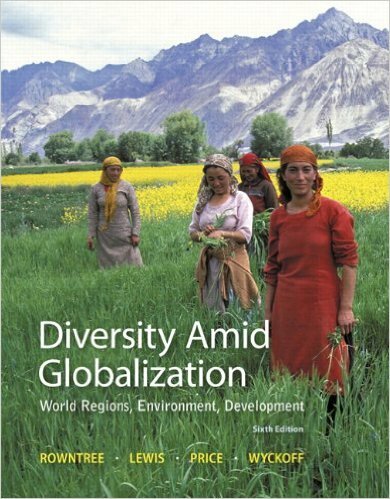 India, for example, has recently announced that it will prioritize economic development over climatic stabilization. The governments of many other countries concur, all but guaranteeing increasing emissions. As result, Oreskes and Conway may claim that they do not personally embrace authoritarianism, but their larger arguments hold that it is nonetheless necessary if civilization is to survive in any form. Finally, given their own predictions of shattering disruptions across the world, China’s geographical position ensures that it would suffer vastly more than Western Europe, the historical core of the supposedly doomed Western Civilization. In imagining China’s unlikely survival against the thrust of their own arguments, they evidently find something deeply compelling about its political system. 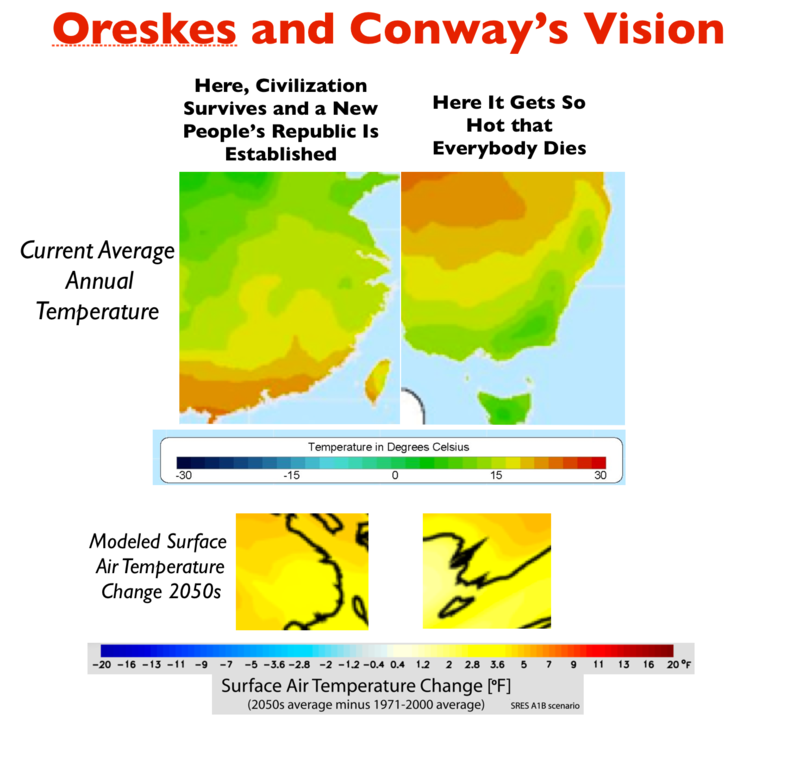 High temperatures, moreover, are by no means the only problems that China would face in the world imaged by Oreskes and Conway. The country is already highly susceptible to drought, especially its densely populated North China Plain. Massive engineering projects are now being constructed to alleviate water shortages in this region, although many experts doubt that they will be adequate. Desertification, likewise, is much more extreme in China today than in North America, let alone Europe. 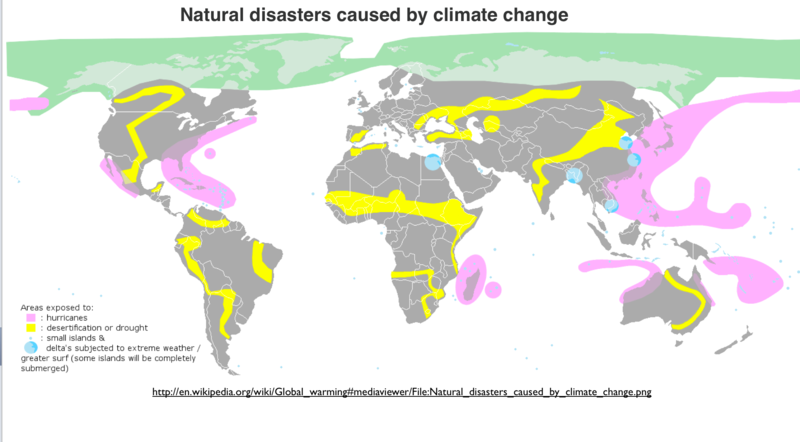 The same story is encountered in regard to flooding; it is no coincidence that most of the world’s truly devastating floods have occurred in China. 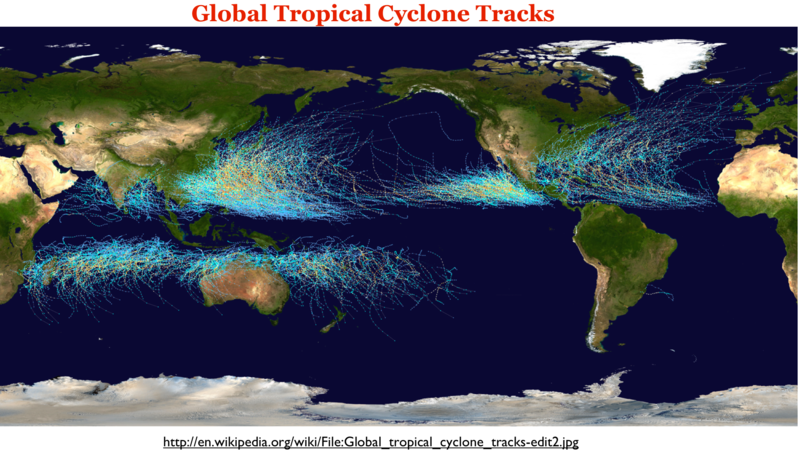 And it goes without saying that the surge in tropical mega-storms predicted by the authors would have a vastly greater impact on China than on Europe. The same is true in regard to the terrifying northward surge of tropical diseases that the authors envisage. Finally, even specific calamities imagined by Oreskes and Conway, such as the failure of the Asian monsoon—generated it their view not by global warming but rather by geo-engineering efforts to forestall it (p. 27)—would devastate China but spare Europe. As a result of such considerations, it is odd indeed that the authors imagine China surviving while the Western Civilization of Europe perishes. In a few passages, Oreskes and Conway seem to indicate that China will be able to meet the challenge of climate change with relative success due to its foresighted environmental policies. Considering China’s environmental record to date, this is a most curious argument. Although China does subsidize renewable energy—as do most Western countries—it continues to spew carbon dioxide with abandon. More important, it unquestionably prioritizes economic growth over environmental protection. The most recent figures show that China’s per capita carbon dioxide emissions have just surpassed those of the European Union, which is an extraordinary development considering the fact that the EU is much more prosperous than China. China, for instance, took steps to control its population and convert its economy to non-carbon-based energy sources. These efforts were little noticed and less emulated in the West, in part because Westerners viewed Chinese population control efforts as immoral … (p. 6). In actuality, certain Western countries have made greater efforts than China to move to a non-carbon-based economy, albeit with checkered success. *** But any such accomplishments will have no impact on any particular country’s vulnerability to climate change, as greenhouse-gas emissions are a global rather than local matter. What is truly bizarre in this passage, however, is the idea that Western countries have failed to “emulate” China’s population-control policies. At present, virtually all Western countries, no matter how “the West” is defined, have birthrates below the replacement level. Many of them, moreover, post fertility-rate figures well below that of China, including Germany, Poland, Italy and Spain. Yet for all of this, Oreskes and Conway still think that it necessary to scold the West for its failure to enact coercive population control measures. In the end, it is difficult to avoid the conclusion that Oreskes and Conway’s vision of China’s survival is rooted not in the country’s potential for enacting beneficial environmental policies, but rather in its current authoritarianism. Indeed, Erik Conway admits as much in the interview at the end of the book: “authoritarian states may well find it easier to make the changes necessary to survive rapid climate change” (p. 70). The despotic Chinese regime, in other words, is regarded as possessing the ability to force adaptive change on its population, unlike the liberty-besotted West. The authors imagine, for example, that China would be able to effectively arrange mass transfers of people away from inundated coastal plains and other eco-disaster zones. Admittedly, China does has some experience with such relocation programs, having expelled more that a million people from their homes when it began to fill the reservoir behind the Three Gorges Dam. Human-rights advocates, however, generally see such displacements as catastrophic in their own right, but such considerations seem to matter little to Oreskes and Conway. No matter that Oreskes and Conway see every last person in Africa perishing, they still apparently find such a scenario promising as long as Western Culture perishes in the process. As noted at the beginning of this essay, tens of millions of people have reached the conclusion that anthropogenic climate change is a giant hoax perpetuated by corrupt scientific and journalistic establishments. In their previous book, Merchants of Doubt, Oreskes and Conway attribute such benighted views to the money and machinations of oil companies and other organizations with financial interests in the status quo. While I would not deny that such factors play a role, they do not provide a full account. 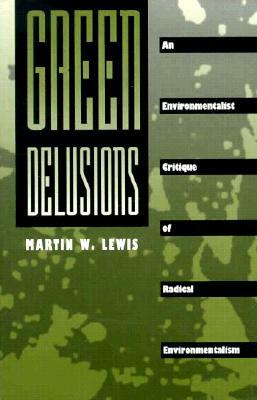 Of particular significance are the writings of green extremists such as Oreskes and Conway themselves. By putting forth grotesque exaggerations, by engaging in misleading reportage, and by embracing authoritarian if not totalitarian politics, they discredit their own cause. The Collapse of Western Civilization, in short, reads as if it were part of a great conspiracy, one that that seemingly rests on an insincere approach to evidence and argumentation. The Collapse of Western Civilization is, of course, merely one thin book, and as such it must be asked whether it can be regarded as representative of even the extremist fringe of the climate movement. But in the final analysis it is not the book itself that disturbs me so much as its reception by the broader green community. Judging from published reviews and on-line comments, it would appear that acclamation has been the most common response. Such acclaim, however, is deeply ironic. Environmentalists generally regard themselves, and are regarded by others, as politically liberal. But when self-styled liberals embrace a work that is not merely illiberal but ostentatiously anti-liberal, I must wonder whether the mainstream environmental movement has any future at all. *A “glossary of archaic terms,” and an interview with the authors, and a set of scholarly notes, bring the page count up to 89. ** It is true that the record high temperature of Hobart (107° F/42° C) exceeds that of both Paris (105° F/40.4° C) and Stockholm (97° F/36° C), but it is still well below the record high temperature of most cities in the U.S. Midwest. The figure for Saint Louis, for example, is 115° F (46° C). *** Germany has probably gone farther than any other country in pushing renewable energy, but its success has been limited. Owning to its dismantling of nuclear reactors, it has been forced to increase its coal and biomass combustion, despite its surging solar and wind energy production. As a result, carbon dioxide emissions have increased, deforestation has accelerated, and energy prices have risen, placing a heavy burden on the poor.